Hours of preparation and advance planning using your information, ideas and vision making your wedding memorable and unique. We will answer all of your questions every step of the planning journey. Professional DJ/event hosts that will M.C. your entire reception. If you already have an M.C., we work together with them as a team to ensure your reception flows smooth all day/night. Two experienced DJ/event hosts, professionally dressed and prepared to energize your crowd. Each of our DJ/event hosts have client testimonials and references showcasing their experience. Crystal clear sound system customized for your venue and ready to bring life to your dance floor. Personal wedding planning consultation at our office with the DJ/event hosts that will be working you to ensure we understand your vision. You get to meet and plan with the 2 staff members that will be working with you at your wedding reception. 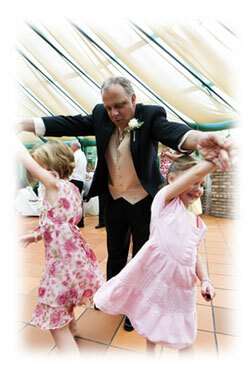 Professional entertainment packages starting at four hours of production time at your Wedding Reception. Packages starting at $1200.00 plus GST within Lethbridge City Limits. 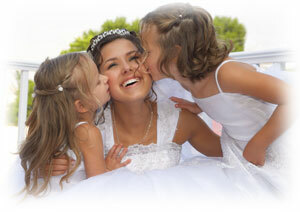 Additional charges may be added/subtracted based on your wedding needs. Travel (outside of Lethbridge), changes to times, lighting, equipment, etc. are a few examples of possible changes. Please contact us for customized package pricing and availability. Additional time can be booked/contracted in advance before the date of your wedding reception in half hour increments at $62.50 plus GST. For more information on ceremony production, lighting upgrades, audio visual equipment rentals, special effects and more - please browse the rest of our website. Do you want some great questions to ask potential entertainment options? Check out our list of questions to ask possible entertainment options and make an informed decision.